DVD to Mobile Phone Converter for Mac – Best Mobile Software on Mac, Mac DVD to Portable Player Software. DVD to Mobile Phone Converter for Mac can rip DVD video to video formats including MP4, AVI, 3GP, 3G2. It can also convert DVD audio to MP3, AAC. With this powerful Mac DVD movies ripping software, you can output video and audio files that can be perfectly played on most portable players such as various video mobile phones, iPod, iPhone, PSP, PS3, Creative Zen, iRiver PMP and many other digital video and audio players. DVD to Mobile Phone Converter for Mac lets you select DVD movies subtitle and audio track to convert your DVD movie with any available language, along with setting video brightness, contrast, saturation and so on. It also allows you to choose any chapters or titles to convert and trim the length of each title or chapter.This mac dvd to movile phone vonverter even allows you to convert the selected DVD contents into one file if you don't want to generate a file for each chapter or title. 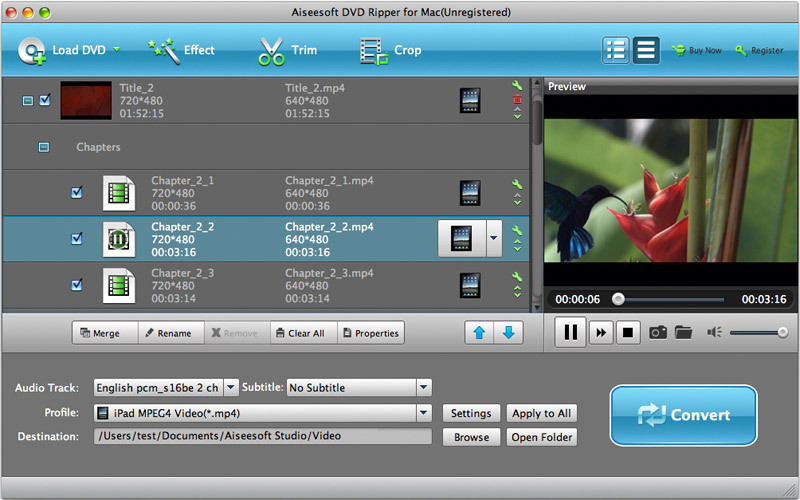 professional dvd to mobile converter developed only for Mac OS X users. A powerful Mac DVD ripping software program to rip DVD movies to regular video files such as MP4, AVI, 3GP, 3G2. Rip DVD audio to MP3, AC3 for Mac OS X users. Rip DVD movies to play on iPod, iPhone, Creative Zen, iRiver PMP, Archos, various video cell phones and many other digital video and audio players . DVD to Mobile Phone Converter for Mac allows you to merge and convert selected titles or chapters into one file. DVD to Mobile Phone Converter for Mac is a very easy to use Mac DVD movies converter. With its intuitive and easy interface, you can rip DVD on Mac OS X with just a few simple steps. Why Choose DVD to Mobile Phone Converter for Mac?